A pre-recorded video replay of the June 2017 live seminar, The Articulate Advocate®: Persuasive Skills for Lawyers in Trials, Appeals, Arbitrations, and Motions. Knowing what to say as an advocate doesn’t matter unless you know how to say it persuasively. This interactive program helps you polish your persuasive style and push your communication skills to the next level. You will get on your feet and exercise the muscle memory of learning by doing. If you’re already good, this program helps you become even better. If you are evolving your approach to the art of advocacy, this program gives you the science behind the art to expand your communication skills. This course helps you discover your answer to this question: How do you speak persuasively as you think on your feet? The only way to get better at any complicated skill is to break it down into its component parts. You will learn what it means to speak persuasively with your voice while thinking quickly and clearly with your brain. You will understand how to get your body to channel that powerful adrenaline rush of performance anxiety right from your first sentence. And finally, you will learn the best techniques for practicing all these elements together in the most productive and time-efficient manner. 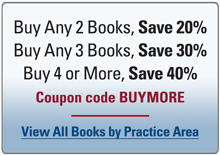 As an added bonus, the instructor's 248-page book, The Articulate Advocate: Persuasive Skills for Lawyers in Trials, Appeals, Arbitrations, and Motions, is included in the registration fee. This seminar is not eligible for discounts.